OutdoorNI.com does Sea Kayaking is the latest in our regular blog feature OutdoorNI.com does - which is our opportunity to showcase the exciting outdoor activities available in Northern Ireland. It’s not often blue skies and sun shine make an appearance in Northern Ireland – especially if you have planned to do something outside! Normally with the mere mention of a trip to the beach the clouds descend and the heavens open so you can imagine my surprise (and obvious delight) when there wasn’t a cloud in sight as I made my way to the sandy shores of East Strand Beach, Portrush for my first taste of sea kayaking. After arriving at the beach and enjoying a quick walk round the impressive new pedestrian promenade I met the rest of the group joining me for the kayaking session and was introduced to Gareth and Steve our friendly and enthusiastic instructors for the afternoon. Straight away it was time to get stuck in and we were kitted out with all the necessary gear including waterproof jackets, buoyancy aids and spray decks (a sheet made out of water-tight cloth sized to fit over the opening, or cockpit, of the kayak to prevent water coming in). It wasn’t long before we were all sitting in our kayaks on steady ground for a very literal ‘dry run’. After learning how to adjust our boats to suit our own measurements we were taught what to do in the event of a capsize - luckily for us the conditions were pretty much perfect so any chances of an impromptu swim where very slim, nevertheless it was most definitely an essential piece of information to learn. Ensuring we had the foundations for an enjoyable journey on the water Gareth and Steve taught us how to handle the paddle, coming round us one by one to make sure we had the correct technique down before we headed out to test our new found skills. It was then time to buddy up and carry our crafts down to the beach – the first arm workout of the day and certainly not the last! After a shove in the right direction we were off - skimming across the waters of the spectacular North Coast Sea Kayak Trail. As I glided along with minimal effort over the crystal clear water I almost forgot where I was letting my mind wonder with thoughts of the Caribbean until the Northern Irish accents behind me confirmed such idyllic places do actually exist right on our doorstep! We continued to paddle along in twos, kissing the coastline and exchanging banter along the way. After putting our steering skills to the test getting up close to the rocky coastline we then began to make our way over to the impressive skerries – a chain of small islands formed from cooled volcanic lava. Keen for us to experience the beauty of this section of the coast that can only be explored by water Gareth and Steve pointed out the wildlife on the island including the large population of breeding seabirds and told us to look out for the rabbits – I’m still trying to work out how they got there! In an effort to help us appreciate this rich area of fossils Steve challenged us to kayak as close to the island as possible without playing dodgems with the rocks – all I can say is thank goodness plastic doesn’t dent! Deciding we had to get evidence that the sun actually does shine in Northern Ireland the guys got out the Go Pro camera for a group shot - it was time for the first serious manoeuvre of the day. Thinking I was coping rather well with the 180 degree turn after looking over to see everyone waiting for me in a perfect line and Steve remarking ‘I’d hate to see you reverse a car’ (which I have to admit isn’t a pretty sight!) I eventually managed to slide into position for the Kodak moment. Photo shoot over we continued to navigate between the basalt islands whilst a few friendly seals popped up to say hello. Before we knew it, it was time to start heading back in with the current behind us to give a welcome helping hand as we paddled our way back to East Strand. Having previously never paddled before I really did feel that I had achieved a lot in an afternoon with the guided journey allowing me to put the skills learnt at the start of the session into practice. 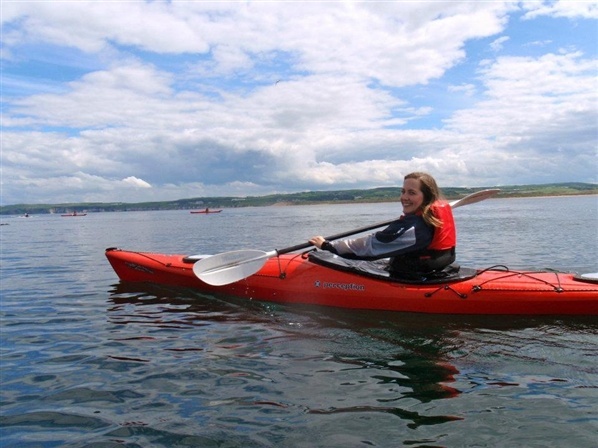 It also gave me the opportunity to experience just a small glimpse of what the North Coast has to offer to sea kayakers, opening my eyes to the endless possibilities for day paddles and expeditions on Northern Ireland’s Coastal Trails . It is safe to say that ever since our paddle the rowing machine is no longer doing it for me! I’ll happily swap a workout in the gym for clear waters, stunning views, and a fresh breeze any day. However not only was my introduction to sea kayaking a good work out it was definitely a memorable experience and one that has left me unable to think of a more relaxing and peaceful way of experiencing an unique perspective of Northern Ireland’s incredible coastline. Know someone who might like to give this a go? 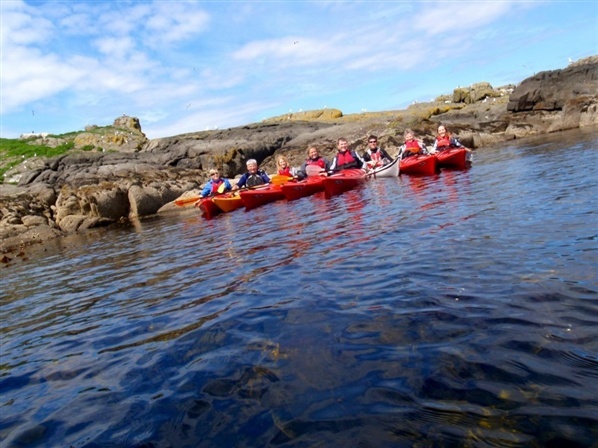 You can purchase the ‘North Coast Sea Kayaking Experience’ online from the OutdoorNI.com Gift Voucher page.